Penny Classic Skateboard - Burgundy, 22"
What is a Mini Cruiser Skateboard? The best penny boards are easy to be confused with a skateboard. However, depending on their size, style and board, there are different kinds of skateboards. Two of them are penny boards and mini cruiser boards. Even though both are essentially small but they are not exactly identical. Skateboards have come a long way from being just a board on four wheels to well defined stylized boards designed for stunts and tricks like ollies and flips. In order to get the most suitable product, you have to look into every aspect of the product and know it inside out. We will provide you with a helpful guide about buying both cruiser boards and mini cruiser skateboards. Read on to find the product of your dreams – you won’t be disappointed! This product takes the original classic penny board to the next level through its cutting edge design and perfect ride. If you are particular about details then this is the skateboard for you as the board is color coordinated from deck till the cushions and bearings. At 22 inches, this board weighs only 3.9 pounds so you can imagine how light it must be to carry in your arm. But you will not want to carry it when you can enjoy the smooth ride thanks to its soft wheels. Why We Liked It: We love it. This cruiser skateboard is every bit cool. The board boasts a cool summery print of leaves and the best part is that it glows in the dark. It is not just great in terms of looks; the state of the art plastic deck delivers high quality too so that your ride is as good as the shiny board. 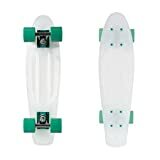 A bit more expensive than other penny skateboards but it is definitely worth the money because you get the authentic Classic Penny Experience. This is yet another great skateboard from Mini cruiser Skateboards with penny trucks and wheels. This 27 inches skateboard is perfect for beginners as it is way more stable than a 22inch board complete. So if you are someone looking to give skateboarding a try, this would be the skateboard you need. No matter what age, it is strong enough to withstand adult weight. It is safe to say that it is a speed board as it can easily go a long distance pretty fast enough. Offered in three color combinations, you can choose to customize it with grip tapes. Buff, slater and spike are the color or style names for the complete penny skateboard that is definitely a winner in terms of style. It gives a good handle just like any other cruiser board complete thanks to its classic waffle deck. The slater is very expensive as compared with the other two color combinations and other penny boards on this list. However, all of them live up to the cruiser brand name and deliver quality. Although 22 inches in size, it can be used by a beginner especially if it is a kid using the penny skateboard. Color combinations and styles seem to be an important consideration among skateboarders but then there are some of us who just prefer solid black in almost everything. This black penny nickel graphic cruiser is exactly for such individuals who prefer simplicity and minimalism. Containing quality 4 inches penny trucks and Abec 7 bearings and 59mm wheels, this skateboard comes ready and complete for you to ride. Since penny boards are better for riding, this can make a great choice for cruising around campus or your neighborhood streets. Anyone from beginners to pro can ride this amazing penny nickel graphic cruiser. This 22” mini skateboard cruiser from Rimable is small but very strong as it can bear up to 90 kilograms of weight. The thick Aluminium trucks support the board complete and allows it to stand this much weight. It is the reissue of the 1970s plastic board but in all new glory. It is good for both kids and adults and the print on the board matches with the wheels so you get a uniform look. No assembly needed as it comes complete and ready to hit the streets with. It is super affordable as well compared with penny skateboards which can be a tad bit expensive for a skateboard. This skateboard is much like a traditional 22 inches penny skateboard. However, it has the Skatro flex technology which ensures that the plastic in the deck is optimal and flexible plastic. They use special machine to calculate the plastic that goes into the making of the boards so as a result the deck is much more consistent than a regular skateboard’s deck. The smooth wheels add to the smoothness of the ride the skateboard offers. Moreover, the bearings used in this skateboard are stronger than regular steel bearings in other skateboards. 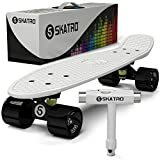 Skatro mini skateboard cruiser complete is definitely strong and provides good value for money. With so many color combinations to choose from, you will be confused as to which color you should go for. There is something for everyone from Solid Black to Ethiopian Tribal Prints to Hot Pink. It is called classic because it is a throwback to skateboards from 70’s. Not only do you get style, you also get the classic feel of the early skateboards. Since it is small, it can fit into a locker or any other small compartment. Like other pennys it is strong and light at the same time. This skateboard from Street Rebels brings together the old and the new. It gives the old retro style skateboard feel with the new high grade urethane wheels. The black one really stands out because of its funky wheels, each having a unique color (red, green, yellow and blue). And if you are looking for some theatricals, there is a glow in the dark option too. It picks up great momentum but is still good for kids, especially those who want to improve quickly. Want the authentic made in Australia cruising experience? This Nickel skateboard (27 inches) combines quality and style which is what penny boards are about. You have many colors and styles to choose from. From young children to college students, this particular penny skateboard is for everyone. You do not have to worry about its wheels or trucks as there is no assembly required. It is super easy to carry anywhere as it weighs only 5.5 pounds. It should easily last for quite some years even after rough usage because of its strong molded plastic board. Penny board is a kind of skateboard made from plastic or maple. It was made in Australia and typically comes in two sizes 22 inches and 27 inches. There is a third size as well measuring 36 inches commonly called the longboard penny. There are countless colors and styles in these skateboards and their wheels are 59 mm in diameter. What makes them great is their portability: they are light weighted and therefore super easy to carry anywhere. These are ideal for kids and teenagers, beginner and experienced skateboarders alike. The 22 inches long cheap penny board ensures a smooth, zippy and fast ride that can get you from one place to another in a jiffy. This one, in particular, is very light weighted and can easily be fitted into a backpack. Because of their smaller size, they are better for children although even experienced skateboarders use penny boards 22 inches long. If you are just looking to roll it around and do not do much stunts, then this penny board will make an ideal skateboard for you. The longer 27 inches long penny board commonly referred to as the Nickel is heavier than its 22 inches brother but still light weighted. It can provide you with a ride similar to a longboard. However, it is much more portable than a longboard. 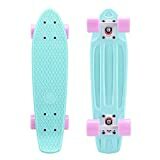 The only thing besides size that distinguishes 27” penny board from 22” cheap penny board is that that it is more stable. This is good for late teenagers as it gives more control and can be ridden for quite a long distance without any hindrance. It is good for learning tricks as it gives a bit more board under your feet. Both these penny boards are similar when it comes to quality especially when the brand is same. 22 inches skateboard is recommended for children under 10 and early teenagers as it is commensurate with their height and weight. It should be noted that it is not suitable for adults especially those weighing over 175 pounds because the board may get damaged due to the weight limit. The longboard which measures 3 feet (36 inches) is the longest penny board and can somewhat qualify as a traditional longboard but it is still lighter. It gives enough length and support to the experienced rider with a little aspiration for doing tricks. It is suitable for late teenagers only as for kids or even early teenagers it can be too big. Penny Australia is the most popular brand for penny boards. Their penny boards are customizable too so you can change the trucks, wheels, and panel stickers. They are very durable because of their quality plastic and powder-coated aluminum trucks. Ridge is another good brand for penny boards and it is cheaper than Penny Australia Classic. You can also find good and affordable pennys with Sun Boards and Eightbit. Penny boards are affordable and you can find a decent one in under $100. Cruiser skateboards are made purely for riding and rolling around and are not purposely built for tricks. They come in many different sizes. The small plastic boards are dubbed as the mini cruiser skateboards. They have smaller wheels about 55-56 mm in diameter. Like penny boards, mini cruiser skateboards are light weight and easy to carry around when not under your feet. They are great for the purpose of riding as they can go long distance uninterrupted and the soft wheels can stand harsh surfaces easily. Skateboards are not just for doing stunts anymore as many kids use skateboards to go to school or gym. Why? There is no hassle of finding a parking for your bike or car. It is so lightweight and small, you can even put it your locker. The great thing about mini cruisers is that they are good for anyone. They are long enough and stable for long rides. For beginners, a simple built mini cruiser is more ideal whereas for those looking for a bit more than just simple rides a cruiser complete with a bit more edge (better trucks, wheels and stronger board) is more suitable. Mini cruisers are obviously smaller in size as compared to longboards. Any board above 36 inches can be considered a longboard. Mini cruisers have soft so-called cruiser wheels whereas longboards have hard wheels. Because cruise skateboards are made for enhancing the ride experience, they are not great for rough and aggressive tricks typically part of the longboarding styles such as downhill and freeriding. They are built to be sturdy and big enough for doing tricks. Longboards are heavier and therefore less convenient to carry around as compared with mini cruisers. The wheel size varies between the two as well where longboards’ wheels are 70 mm and above in diameter. As for which one is better for whom, longboards are not recommended for newbies who have never ridden a skateboard before. For such less than experienced riders, a mini cruiser complete is a much suitable alternative because they can ride it without needing training and learn basic tricks as well. Longboard is a pretty generic term as these boards vary by not just size but also by the riding style. Their trucks are higher and can turn very sharp. Mini cruisers vary greatly when it comes to price. You can find one under $50 easily whereas on the other end of the spectrum, some may cost even more than $100. Sunset and District are popular brands for mini cruiser skateboards and a bit pricier than other brand offerings. Now that you know what each of them has to offer, you might be wondering which one is better? There is no definite answer to that. Both of them are smaller than a longboard and optimized for riding more than for performing tricks. Mini cruisers vary in size and have smaller wheels as compared with penny boards that come in three sizes with a tad bit bigger wheels. It can come down to your own brand preference and budget for both these kinds of skateboards. For children, the 22 inches long penny and mini cruisers are ideal while teenagers can ride both penny and mini cruisers that are bigger than 22inch board. In terms of styles and colors, both of these skateboards have too many offerings. You can even customize the panels and choose any graphical patterns, textures or just solids. Both of these skateboards offer a smooth ride so if that is your ultimate purpose, all you have to do is determine which size you need.